Do you love androids, cyborgs, and war? Does a homicidal, sentient baboon with genetic mods spark your curiosity? 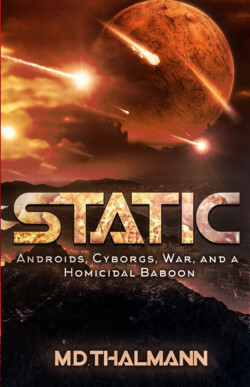 Get the scoop on the cast of Europa Affair, read what started it all: STATIC. An epic solar space opera saga: cyborg armies, nanotech, constant-thrust space-travel, and a solar government that discards the Earth and her people as the regime expands, leaving mankind stranded for a century hoping to reclaim the stars. Elliot Glassman began the war. Halloran will end it. Electromagnetic storms stopped the machines but at what cost? Savages rule the wilderness and pockets of the civilized huddle together in camps to fend them off. Halloran, different and dangerous, leaves the safety of his home to journey across the badlands, pulled towards someone he can feel and almost remember—and together they might just be able to save what remains of humanity.